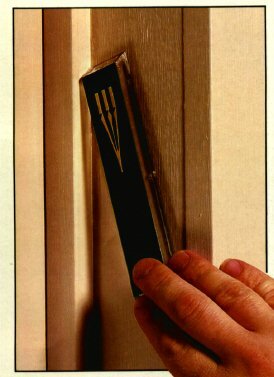 A mezuzah (plural, mezuzote) is a small, usually rectangular, box that is attached to the outer doorpost of the homes of observant Jews and many Messianic Believers. In Biblical times, mezuzah referred to the doorpost of a house. This was where the blood was applied during the first Pesach (Passover) (Sh’mot [Exodus] 12:7, 22, 23). Before and during the time of Yeshua, D’varim (Deuteronomy) 6:9 was taken very literally. Sh’ma, Yisra’el! ADONAI Eloheinu, ADONAI Echad [Hear, Isra’el! ADONAI our G–d, ADONAI is One]; and you are to love ADONAI your G–d with all your heart, all your being and all your resources. These words, which I am ordering you today, are to be on your heart; and you are to teach them carefully to your children. You are to talk about them when you sit at home, when you are traveling on the road, when you lie down, and when you get up. Tie them on your hand as a sign, put them at the front of a headband around your forehead, and write them on the door–frames of your house and on your gates. So if you listen carefully to My mitzvot which I am giving you today; to love ADONAI your G–d and serve Him with all your heart and all your being; then, [says ADONAI,] “I will give your land its rain at the right seasons, including the early fall rains and the late spring rains; so that you can gather in you wheat, new wine, and olive oil; and I will give your fields grass for your livestock; with the result that you will eat and be satisfied.” But be careful not to let yourselves be seduced, so that you turn aside, serving other gods and worshipping them. If you do, the anger of ADONAI will blaze up against you. He will shut up the sky, so that there will be no rain. The ground will not yield its produce, and you will quickly pass away from the good land ADONAI is giving you. Therefore, you are to store up these words of mine in your heart and in all your being; tie them on your hand as a sign; put them at the front of a headband around your forehead; teach them carefully to your children, talking about them when you sit at home, when you are traveling on the road, when you lie down, and when you get up; and write them on the door–frames of your house and on your gates – so that you and your children will live long on the land ADONAI swore to your ancestors that He would give them for as long as there is sky above the earth. Orthodox Jews and Messianic Believers obtain the requirement to fasten the mezuzote, containing the above Scriptures, to their doorposts from D’varim (Deuteronomy) 6:9 and 11:20. Orthodox Jews generally recognize and practice the above laws. However, prior to the Talmud, Jewish groups had a variety of practices, and some of those variations are still used today. The mezuzote found at Qumran had different Scriptures in them from those used today. Some contained Sh’mot (Exodus) 13:1–4, and others contained Sh’mot (Exodus) 13:11–16. The Samaritans placed “mezuzah stones”, upon which the Ten Commandments are carved, at or near their doorways. The Sephardim–Jews from Mediterranean lands and North Africa traditionally affix their mezuzote vertically, not at an angle. Certain laws were developed concerning the religious duty of the mezuzah as rabbinic Judaism formed after 70 A.D. This standardization prearranged everything: the type of parchment upon which to write the verses, how they were to be written, where the mezuzah was to be placed (the kind of building and the specific place on the doorposts), and the differences in practice between Israel and the Diaspora (lands outside of Israel). The rules were first codified as standard practice in the Talmud. Over the centuries, the laws concerning the mezuzah were refined, and various traditions arose. The mezuzah is to be attached at an angle (except for Sephardic Jews) to the top third of the doorpost on the right (as one enters), with the upper portion slanted inward and about a handbreadth from the outer edge of the doorpost. G–d, King of the universe, Who hast sanctified us by Thy commandments and hast commanded us to fasten the mezuzah." Shaddai, one of the names of G–d, is inscribed in Hebrew on the outer side of the top of the parchment. This word must show through the opening in the case so it can be read. For most Jewish people the mezuzah has remained a reminder of the centrality of G–d and His Word. Many non–Orthodox Jews attach mezuzote to their doors as a way of affirming their Jewish identity. Many Jews attach it as a Jewish version of a “housewarming” ceremony. In Israel the mezuzah is attached to entrances of all public buildings and synagogues, though it is only required for residences. The making of ceramic or other decorative cases for mezuzote has become an art form. The mezuzah’s Scripture passages provide enduring lessons for all. The Sh’ma in Jewish liturgy found in D’varim (Deuteronomy) 6:4–9 speaks of love for the one G–d. D’varim (Deuteronomy) 11:13–21 speaks of the responsibility to obey G–d, the results of obedience, and the consequences of disobedience. There’s a big message in that little box called a mezuzah for us as Believers in Yeshua. Let us always strive to fill our homes and our lives with love for G–d and His Word.